Velingrad town is located in the Western Rhodope Mountains. The modern Arte Spa & Park Hotel in Velingrad is surrounded by beautiful and picturesque nature. The hotel interior is luxury and comfortable, decorated with art elements that make it very effect and elegant. Arte Spa & Park Hotel offers wonderful rooms and apartments, restaurants with culinary delights, spa zone, indoor and outdoor pools. We produced and installed a few outdoor signage elements with a high quality corresponding to 5 stars hotel. To manufacture the channel letters on the facade, restaurant and spa center we went through these steps.We combined two different colors acrylic – a black for the returns and a white for the face. This way the channel letters have a bright illumination from front side only. We mounted the letters ahead of the wall using standoffs.This installation ensures an attractive halo lit letters. The vertical signs “Arte Hotel” is made of high quality stainless steel painted in colors of the other letters to look the same way. The logo sign is the most distinctive mark of each business, company or organization. 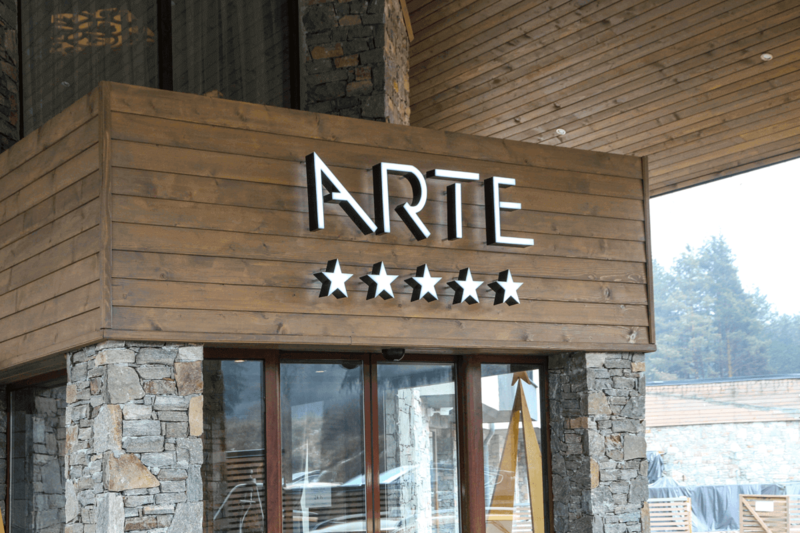 The logo of Arte Hotel is a coniferous tree that we produce in a similar way. Its basis is made of acrylic and the face is wrapped with 3M translucent film. We trusted G.O.Q. LED lighting for the illumination of all signage components to ensure a bright and uniform illumination. The LED modules are designed with the highest IP68 protection and prevent from unwanted defects. Hotel ARTE received an outdoor advertising installation that meets the highest standards of the hotel. It looks perfect and has high durability.